Yesterday was my 20th birthday - I'm no longer a teenager! Eep! My fiance mightn't have been here like I'd hoped, but I still managed to have a nice relaxing day with my family! So what did I do for my twentieth birthday? 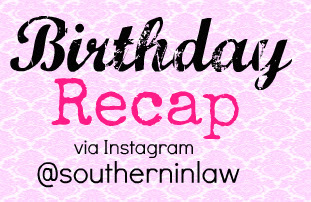 How about an instagram recap? My day started with a Birthday Breakfast - complete with candle! This was one of my favourite breakfast bakes, my Baked Banana Oatmeal which I had frozen in the freezer ready for a quick breakfast! My candle holder was a big dollop of peanut butter, later spread on top! While eating my delicious breakfast (minus candle - don't know how my stomach would handle that!) I got to opening my birthday cards that I'd been mailed. These included an air mailed card from the fiance and one from my lovely friend Jamieanne at The Sweetest Kitchen! Of course, Jesse's card made me cry and smile all at the one time and Jamie's daughter Emma drew me a lovely picture that definitely made me smile! I mightn't have had my fiance with me, but an extremely long Skype call was as good as it could get. Yesterday was too cold and windy and miserable to go anywhere so staying inside in the warmth was the perfect day for me. I grossed Jesse out with talk of Fairy Bread (if you don't know what it is, it's just what you see to the left - bread, margarine/butter and sprinkles). I'm now determined that he has to try it because it's so unusually good and seeing as I found gluten free sprinkles, of course fairy bread was going to be part of my birthday lunch! One of my birthday presents was a Yonanas machine! So you know I had to use it straight away! I knew that I was getting it so I bought dozens of bananas the week before, ready to make yonanas for everyone - but unfortunately they were the worlds slowest bananas to ripen. I did have 1 banana frozen and I'd frozen an apple on Saturday because I knew that wouldn't be enough, so I made a green apple and banana soft serve! The picture looks awful but it was delicious! I ate it in front of the fire to counteract the cold (I'm weird like that). It was then time for movies with my family! I don't usually eat popcorn whilst watching movies, but when you have gluten free, soy free, preservative free popcorn in the house you know I'm going to be eating popcorn while I watch! First up was The Lorax, followed by The Secret Life of Bees. The Lorax was adorable! I love Dr Seuss because of the morals hidden within each story. I'm a big kid at heart and love "kids movies" so The Lorax was perfect! The Secret Life of Bees was a bit of a let down for me - I've read the book and I always find I can never get into a movie I've read the book for - or visa versa! Today my birthday continued and I spent the day with my beautiful Mum who also happens to be one of my best friends. We continued the movie theme as I had a free ticket and went to see Brave - which was totally different than what I expected and really good! Oh.. on Saturday night, I also had a birthday cake.... a birthday banana brownie, to be precise. So tell me - kids movies, do you like them even though you're older or do you give them a miss? nawww sounds like a pretty good birthday to me! And yes, Jesse needs fairy bread stat.. he can't be grossed out with all those weird things Americans eat!